Add 2 or 3 rows of A4, A5 & DL Pockets. 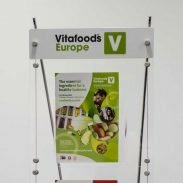 Put different leaflet sizes on each row. 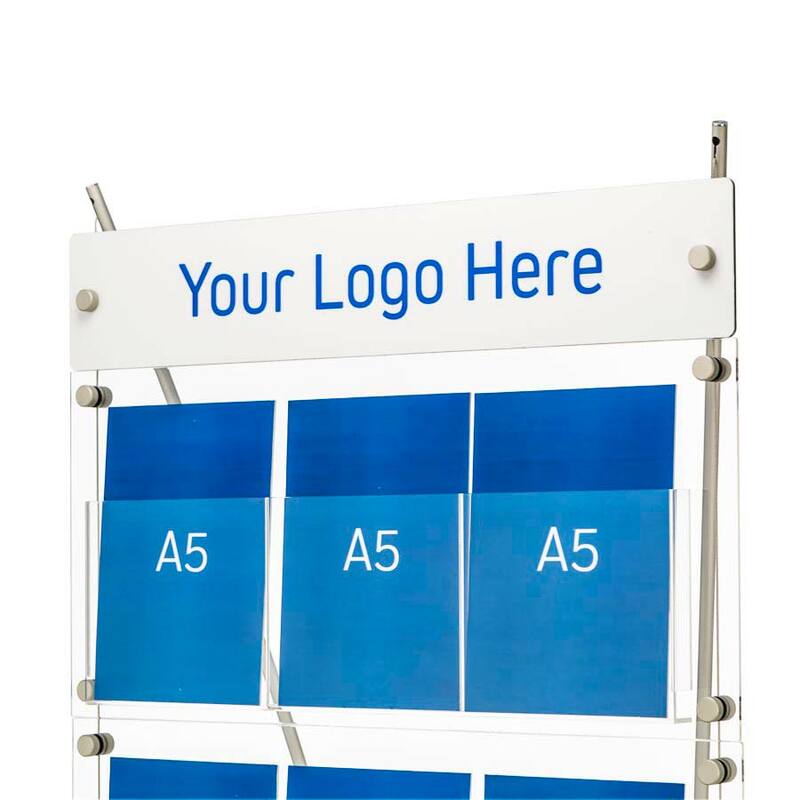 Brand your display with a printed header. Frame is the same for both models. 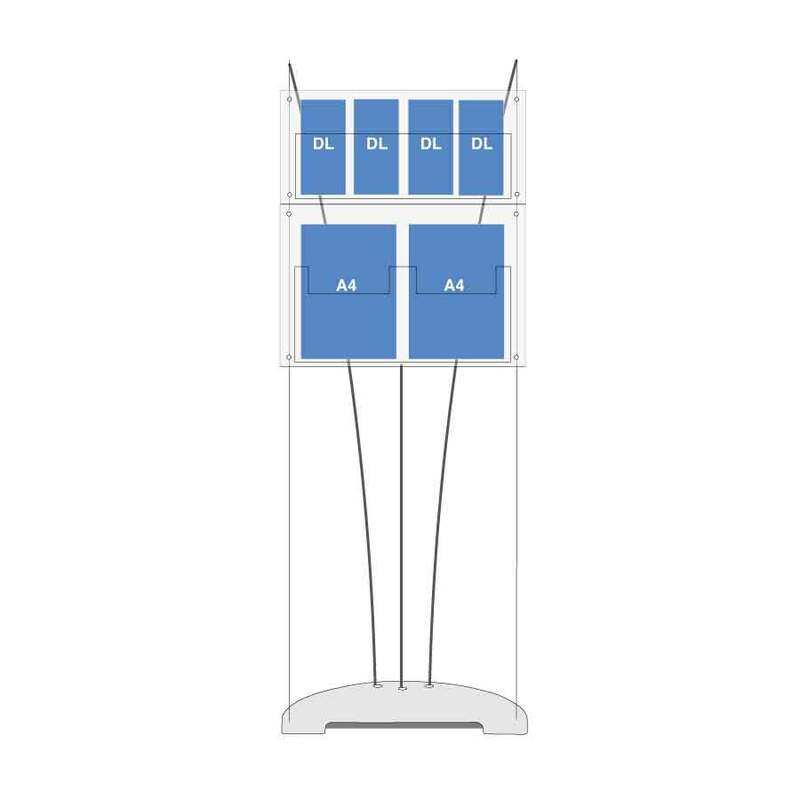 Change cable fixing points to change model. 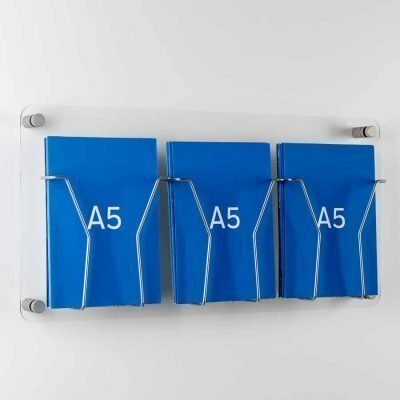 Attach acrylics in any order during assembly. 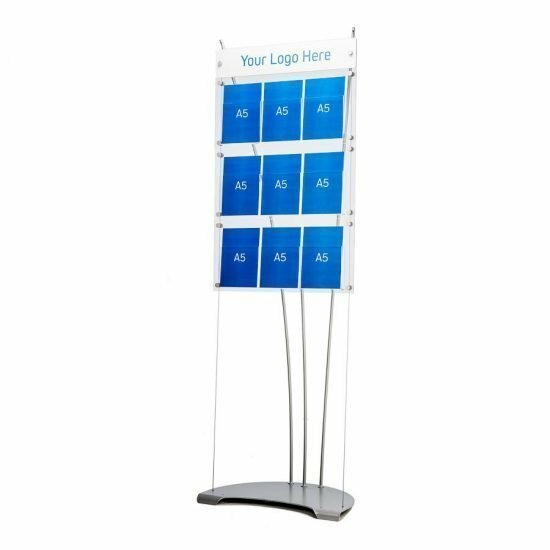 Customise your display by adding a printed header with your logo or a message. 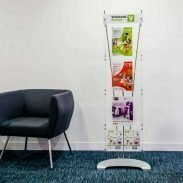 Allow 5 working days for us to produce these. 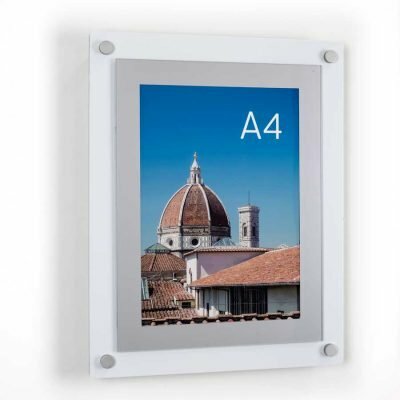 Order 2 - 4 displays and receive a 5% discount. 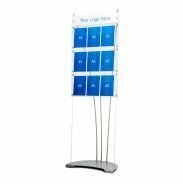 Order 5 - 9 displays and receive a 10% discount. These displays solve the problem of displaying different sizes of promotional literature on the same display stand. 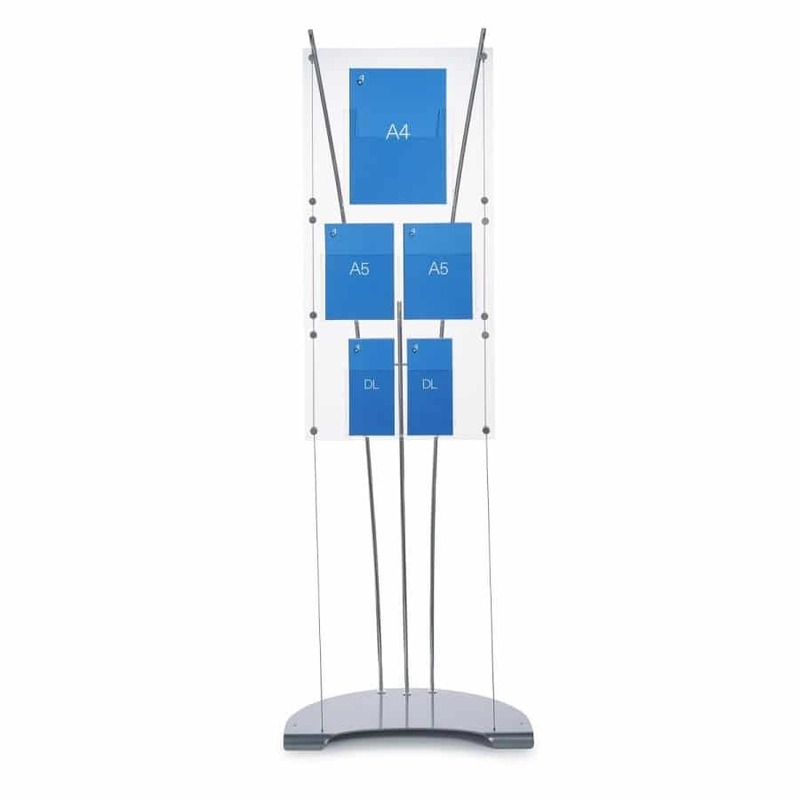 You can mix and match three standard literature sizes A4, A5, and DL on the same display. 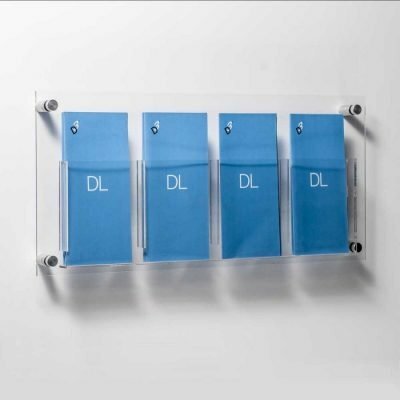 The 20mm deep acrylic pockets are clamped to tension cables so the literature pockets float in mid-air. 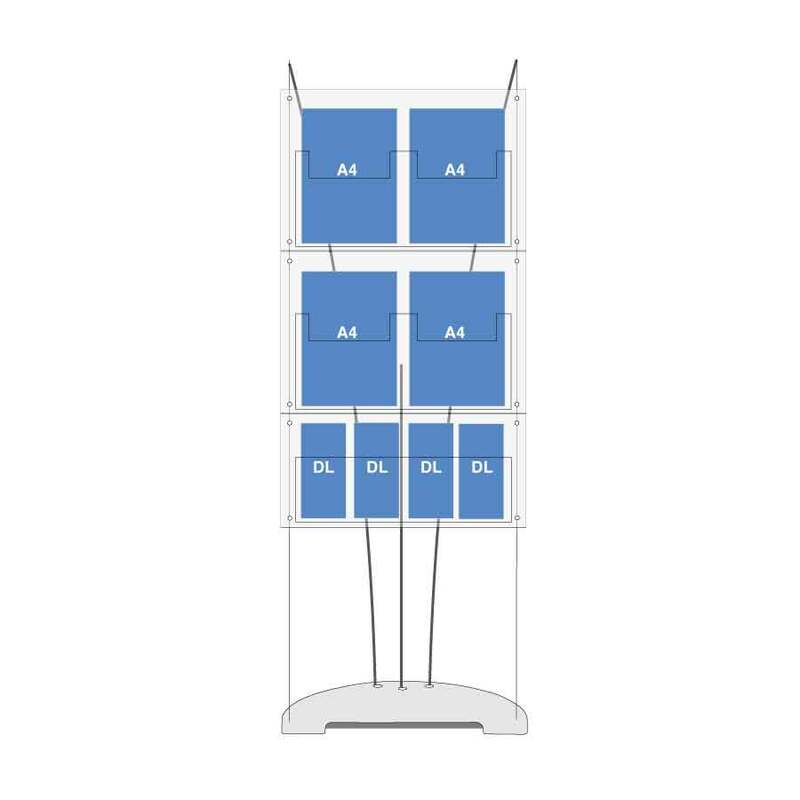 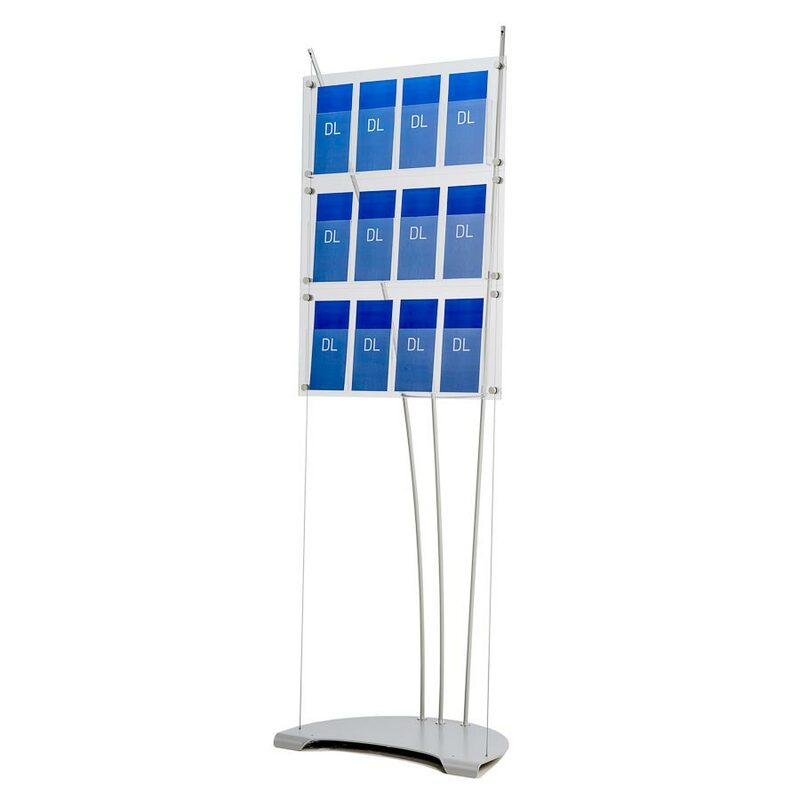 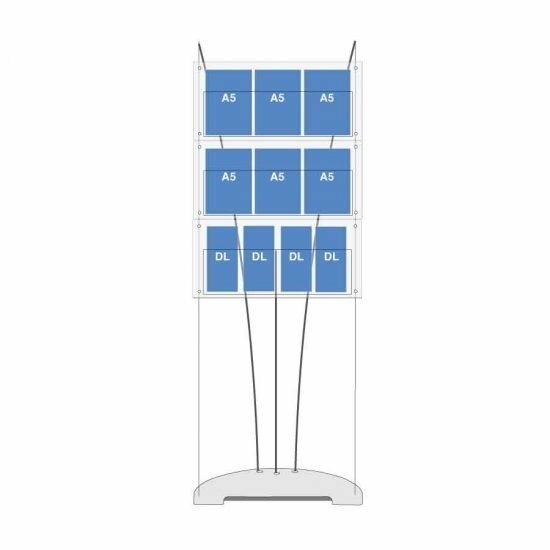 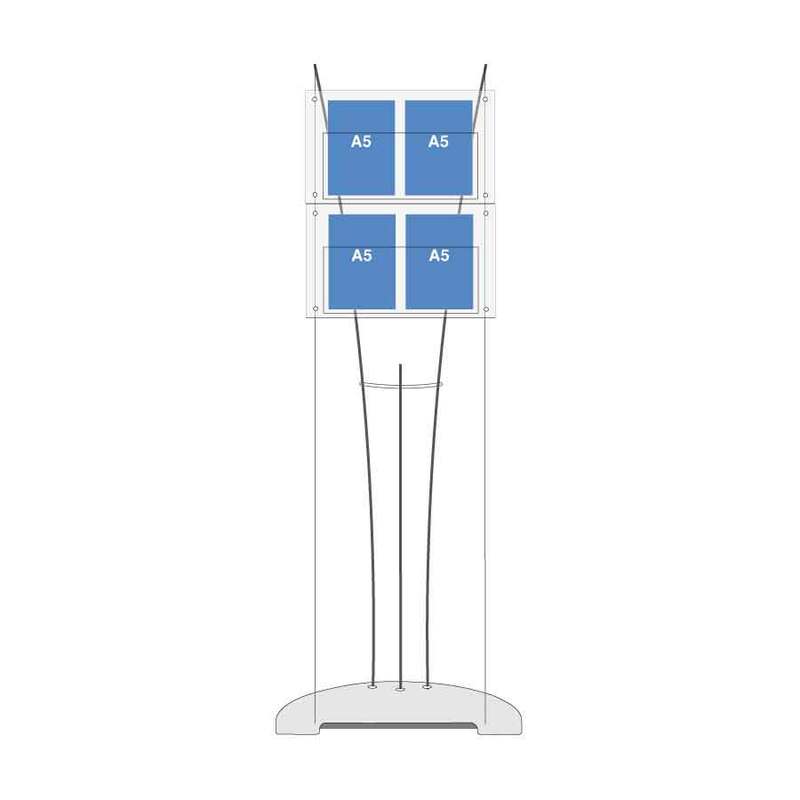 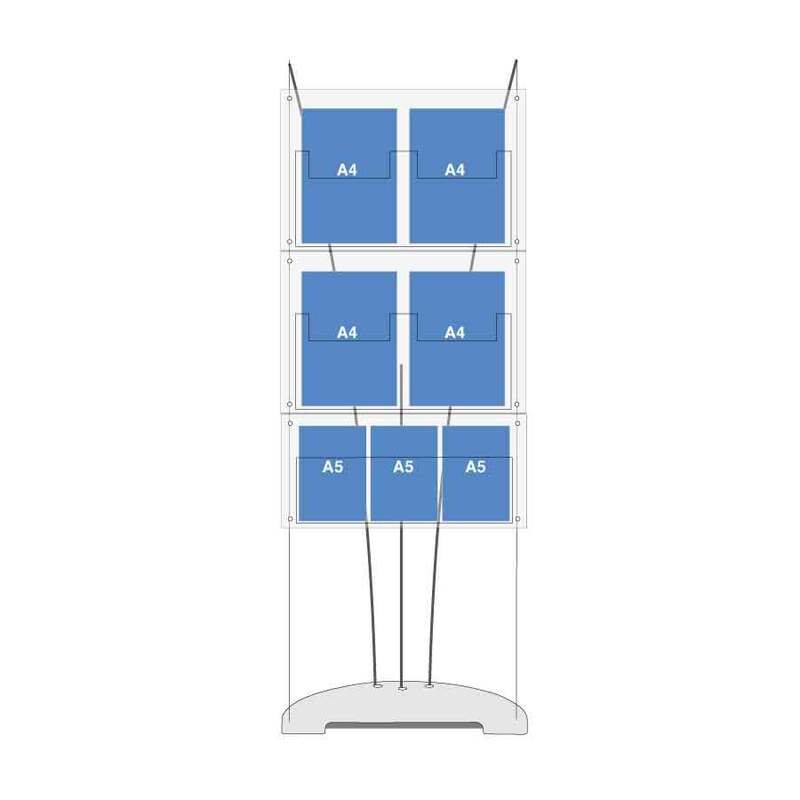 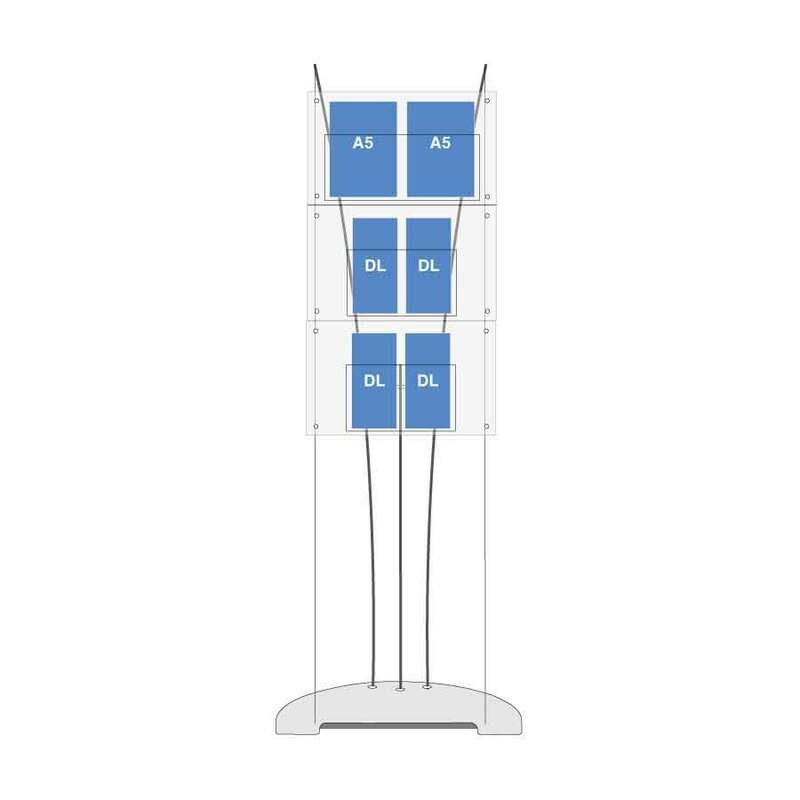 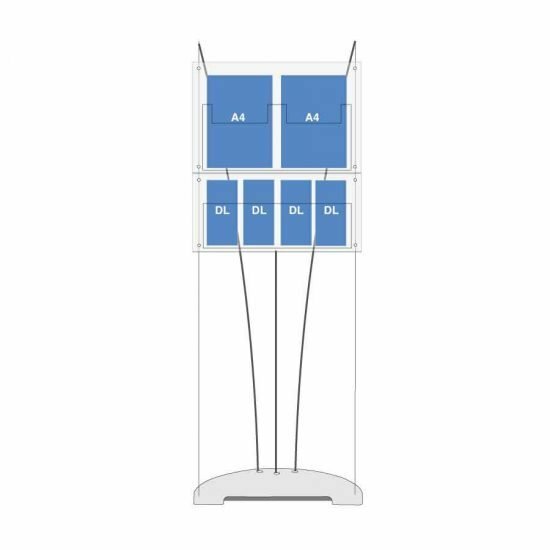 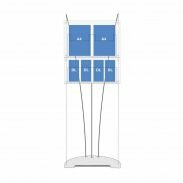 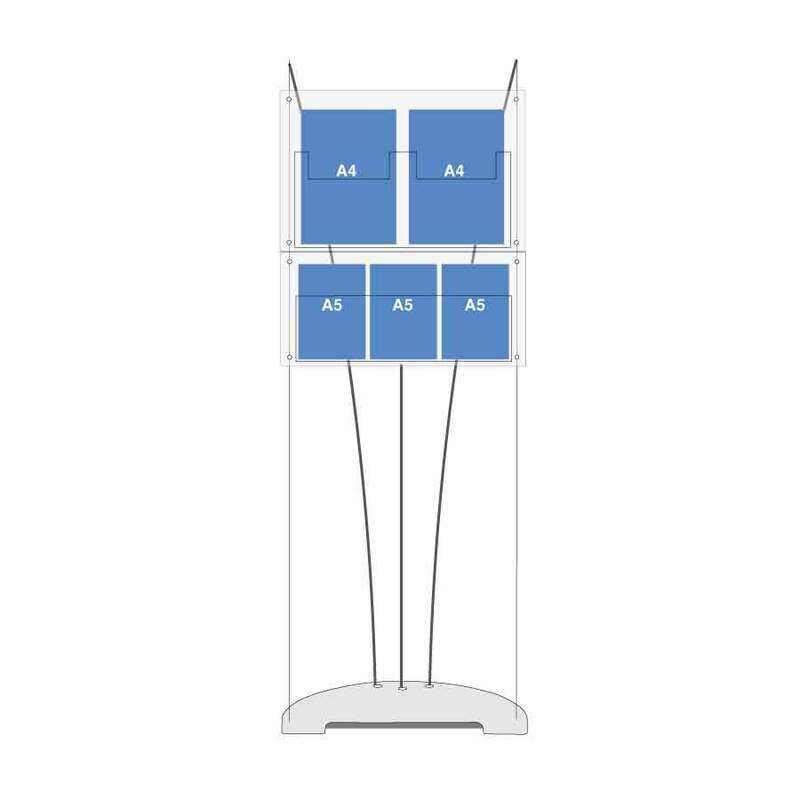 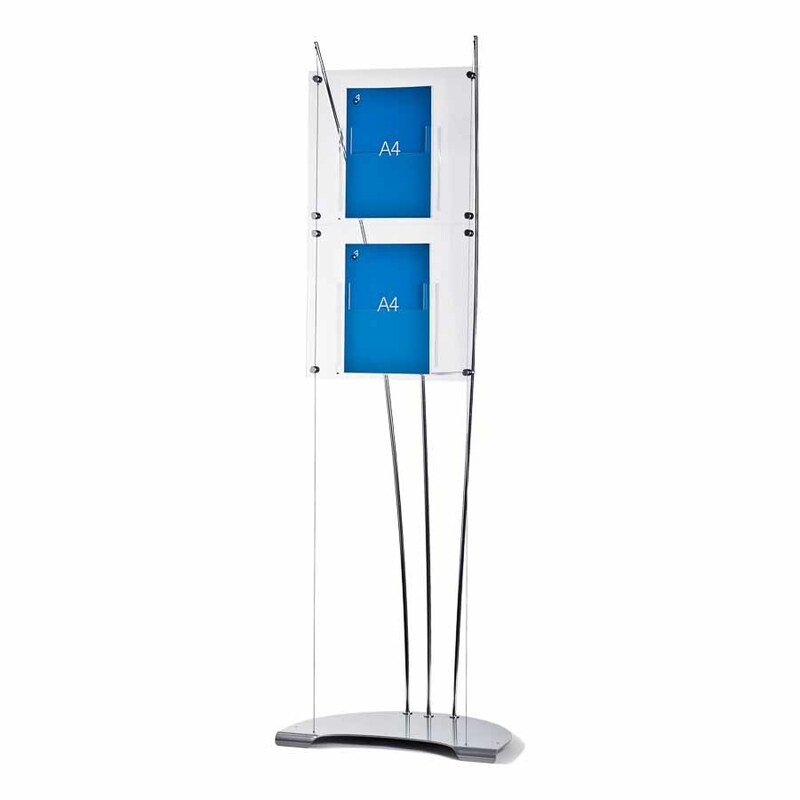 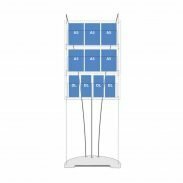 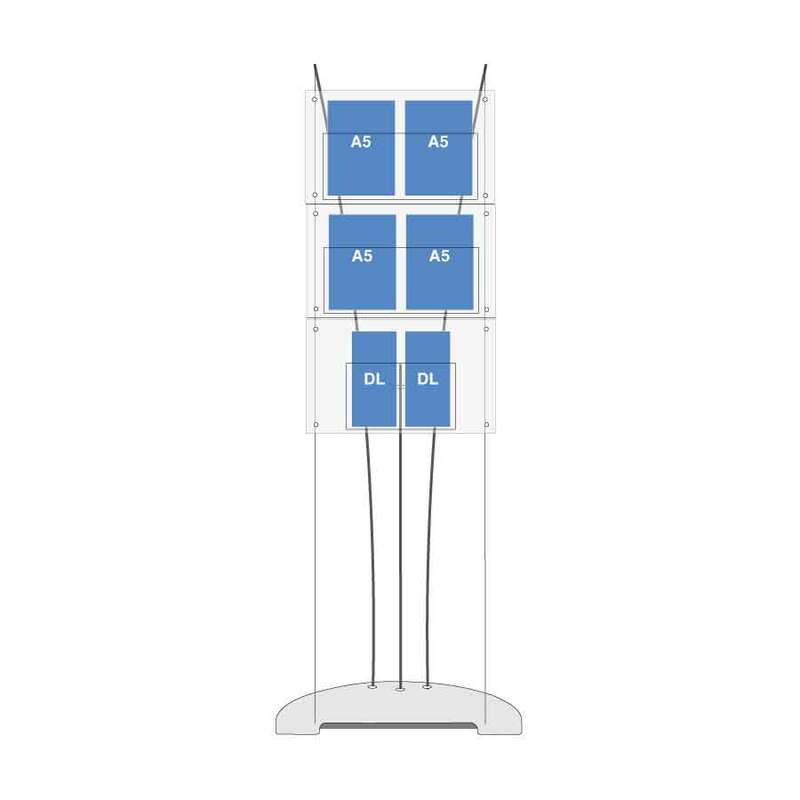 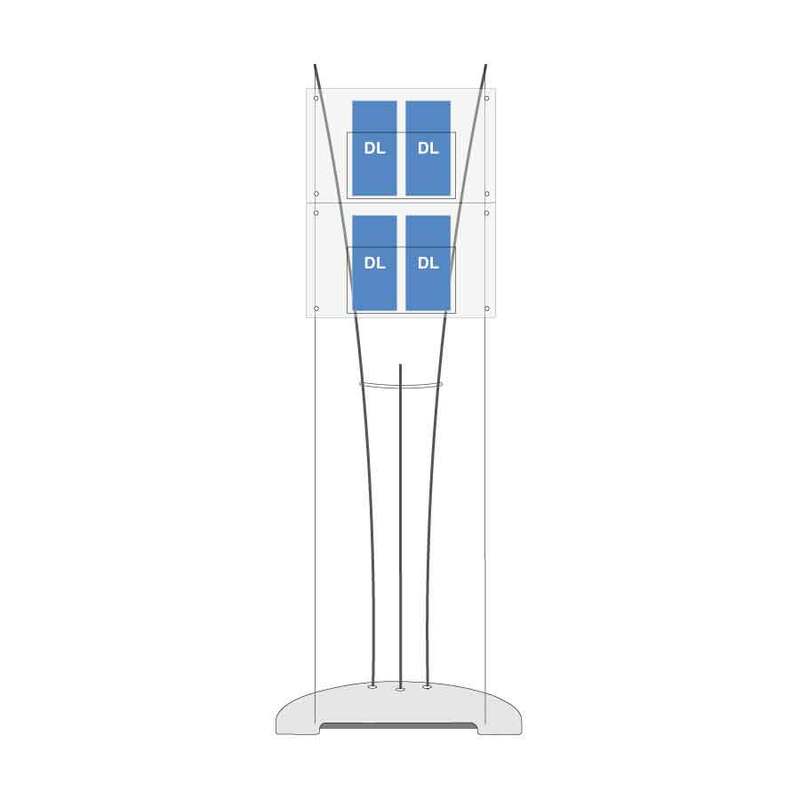 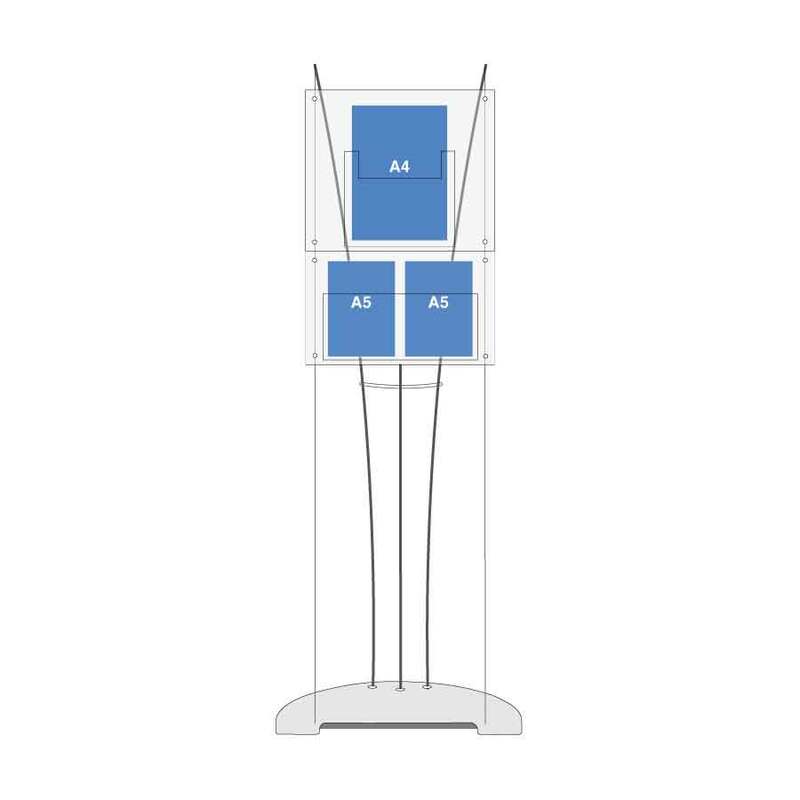 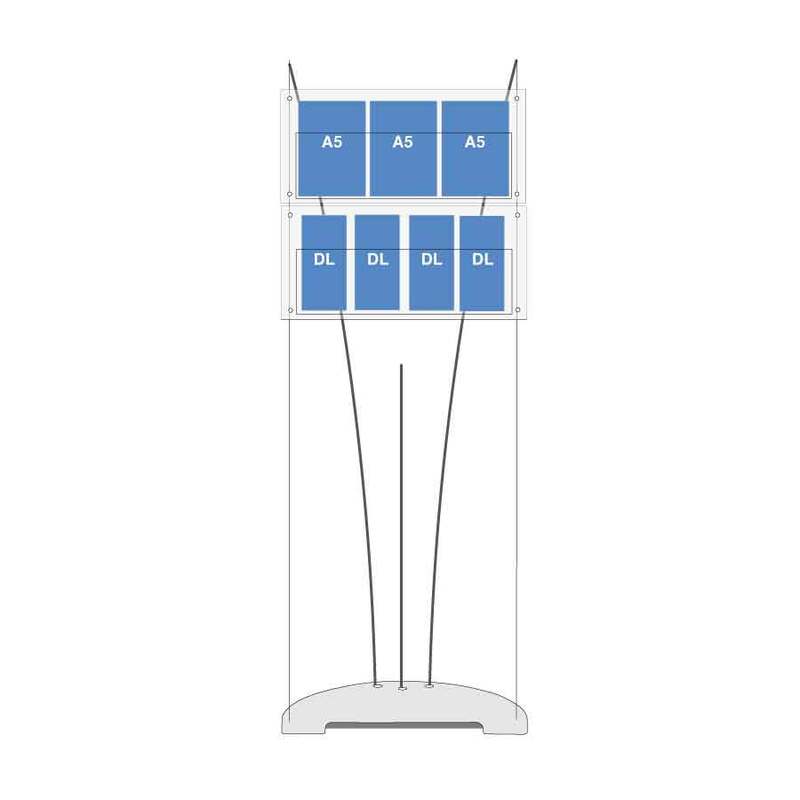 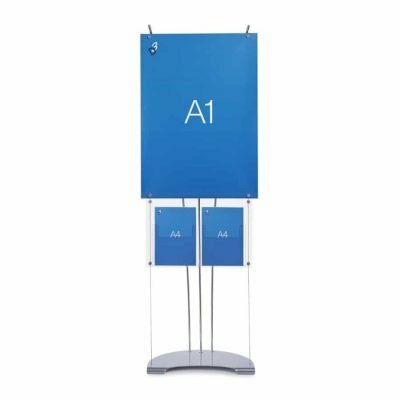 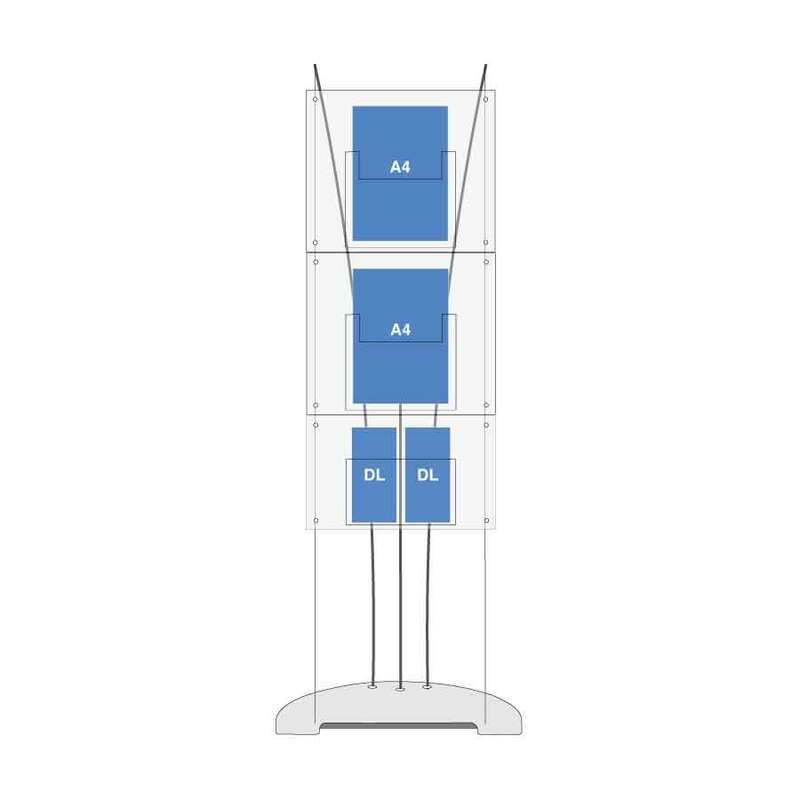 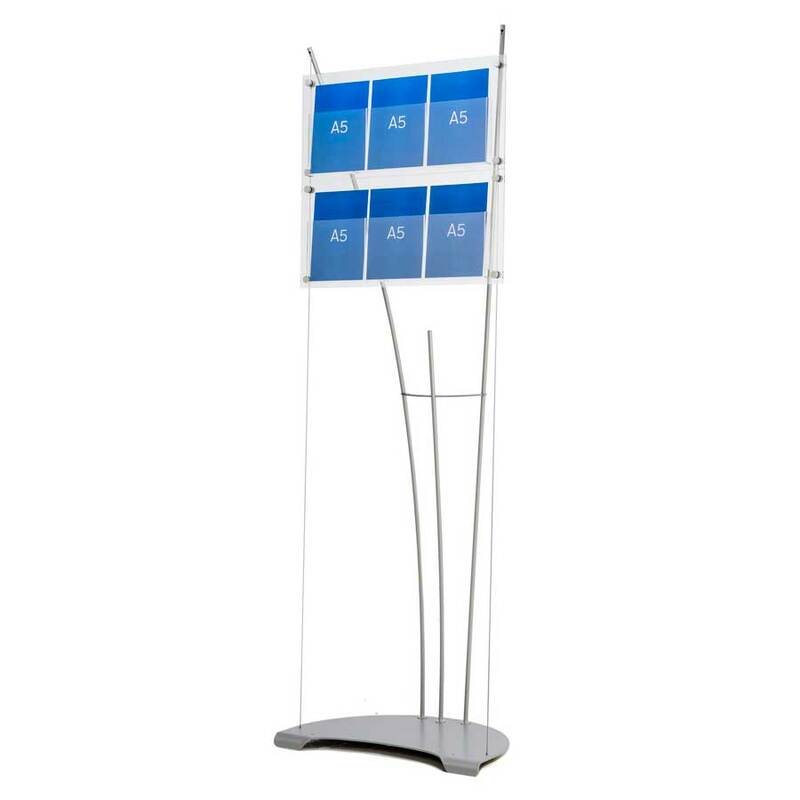 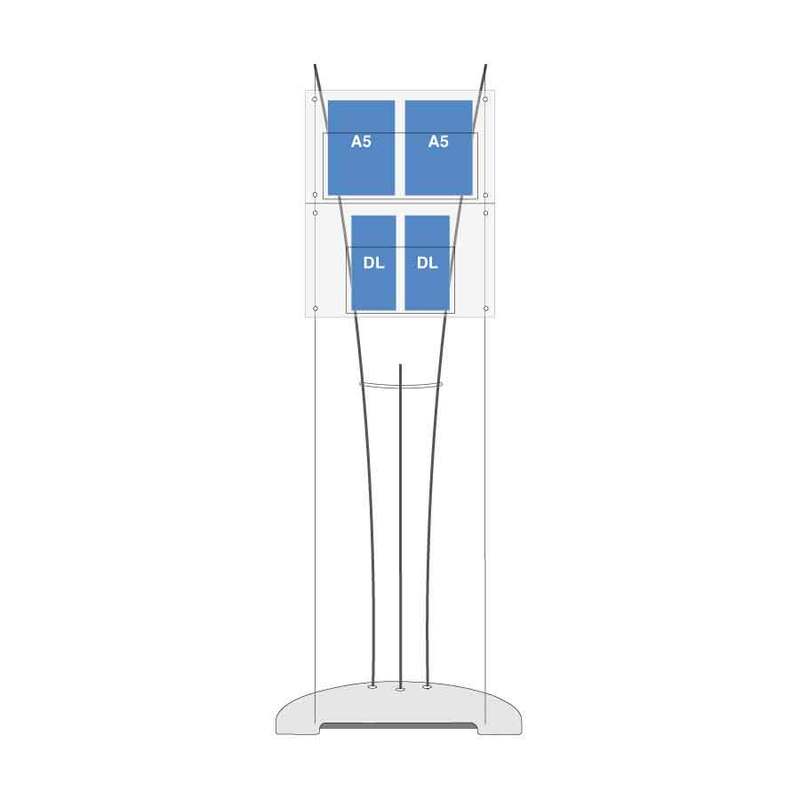 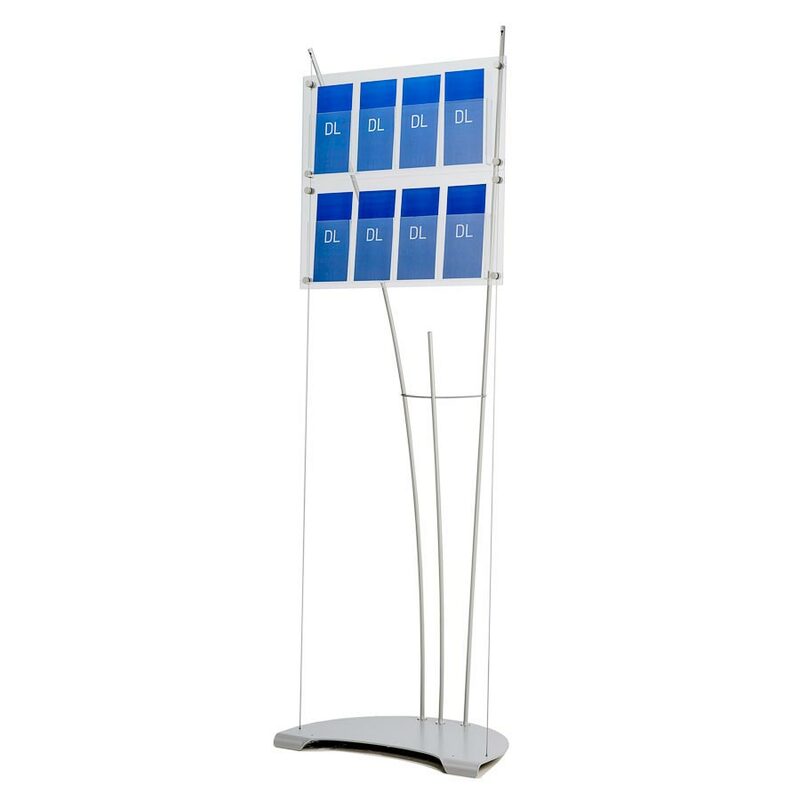 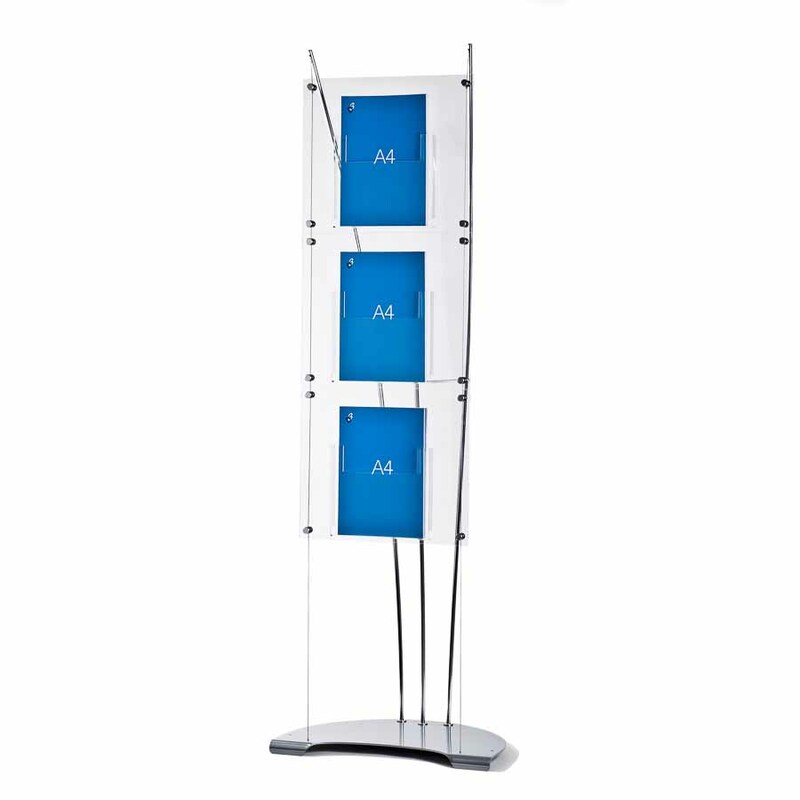 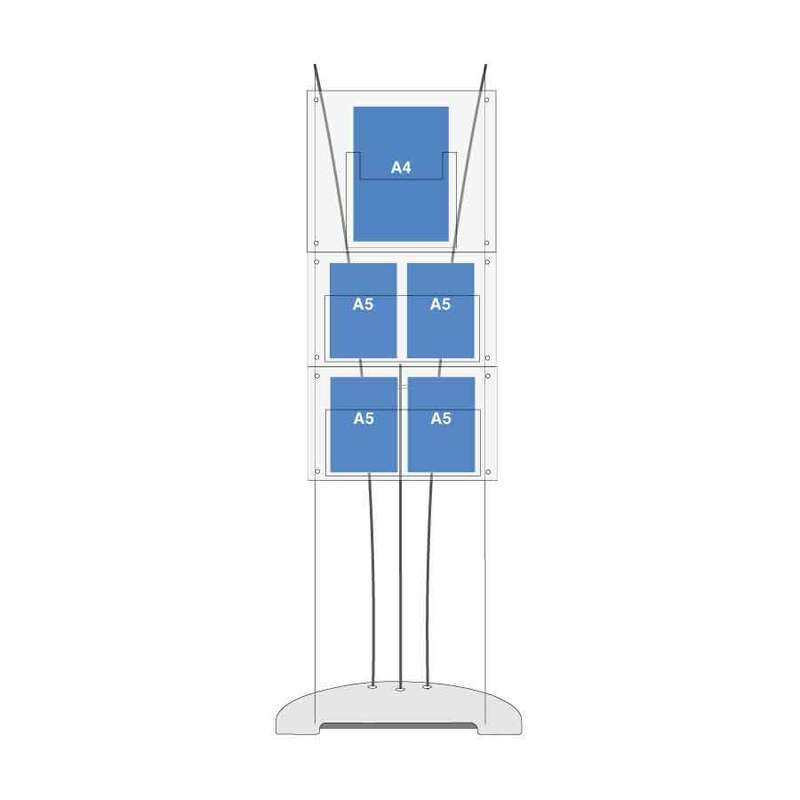 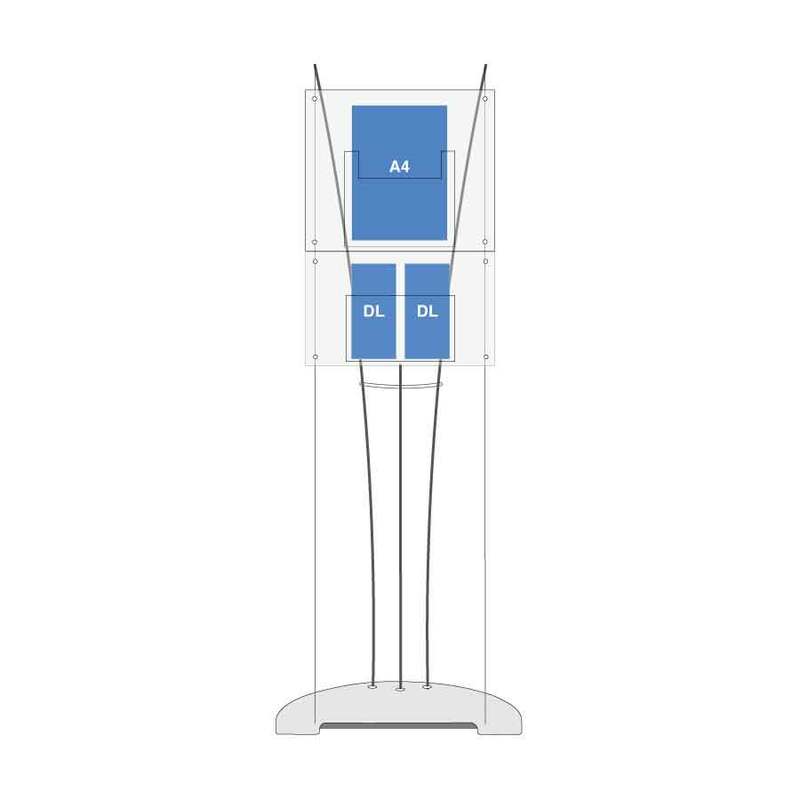 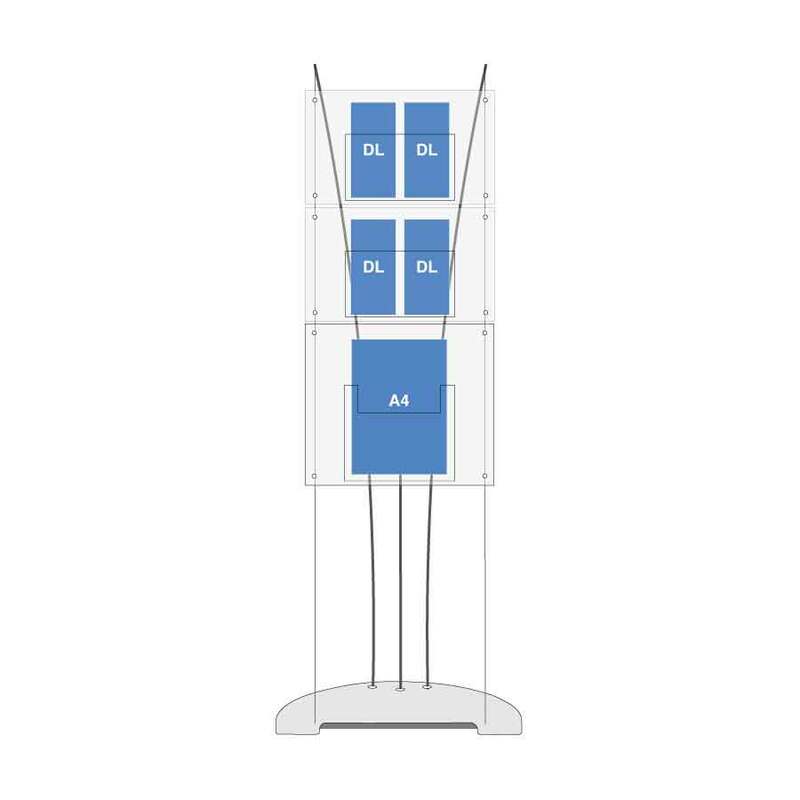 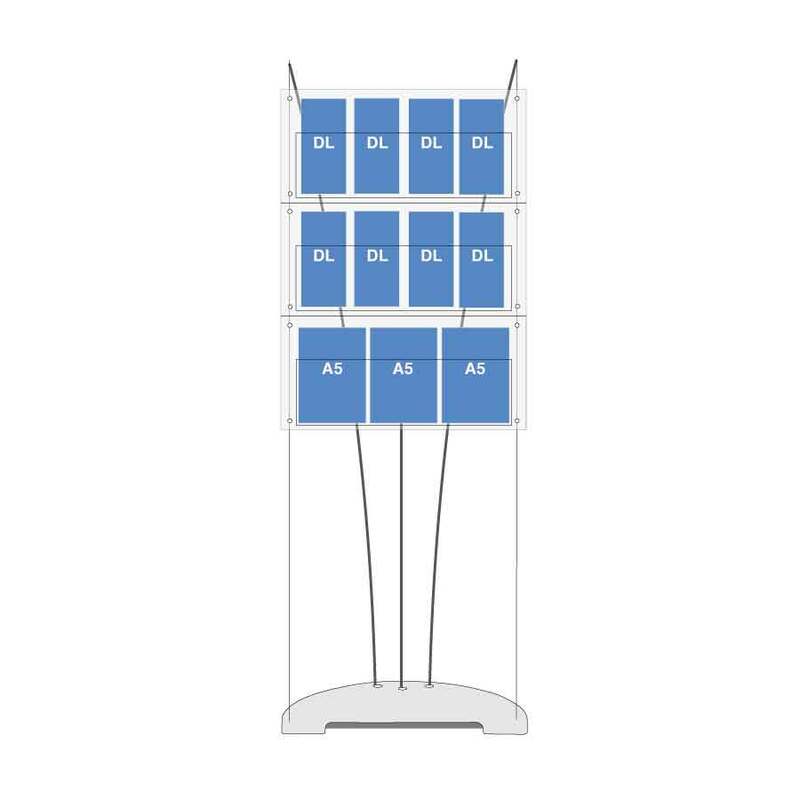 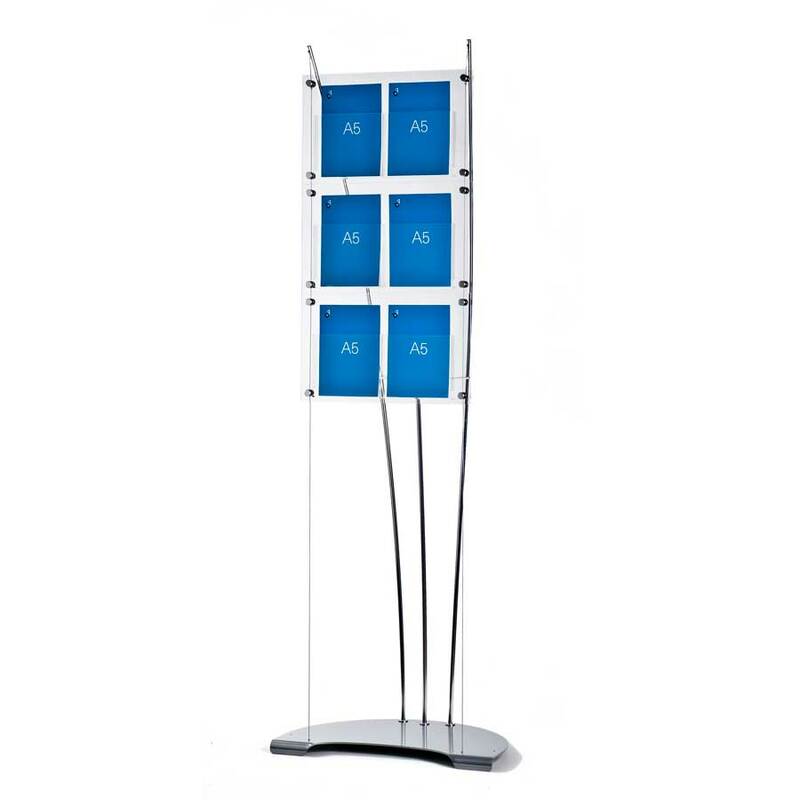 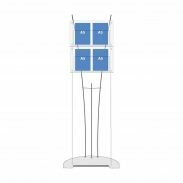 The D3 brochure stands display is a high quality, floor standing, self-assembly, literature display stand. 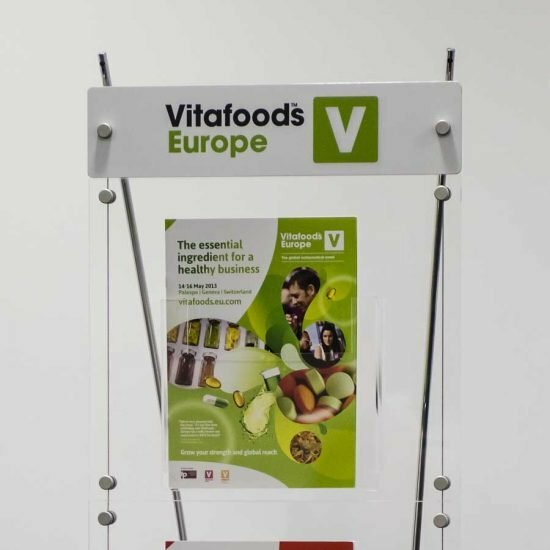 Designed for displaying leaflet, flyers, catalogues, brochures and other types of printed promotional literature. 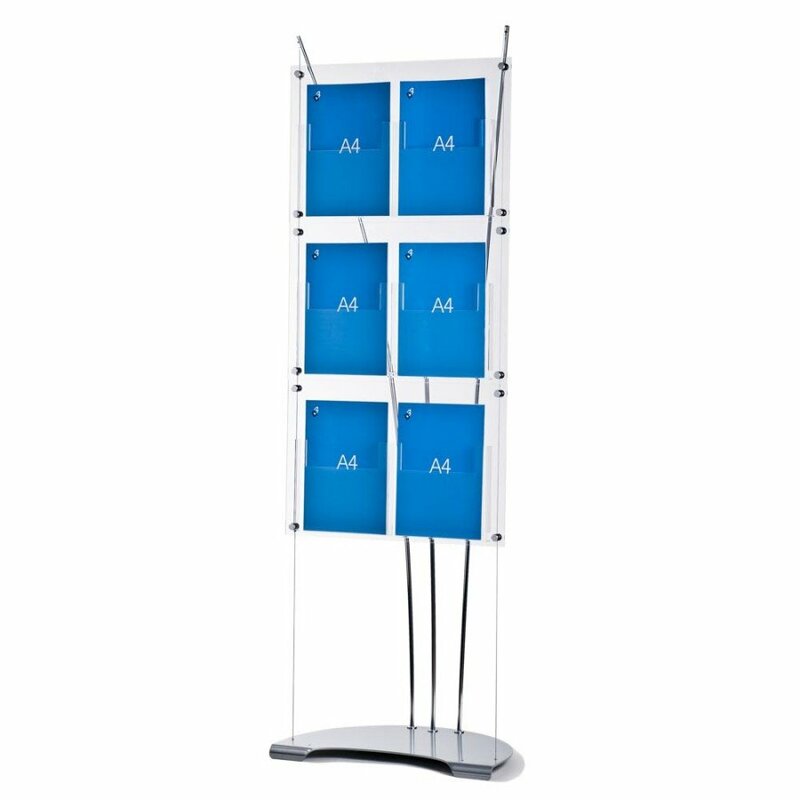 It’s ideal for displaying literature on large exhibition stands, in marketing suites or reception areas. 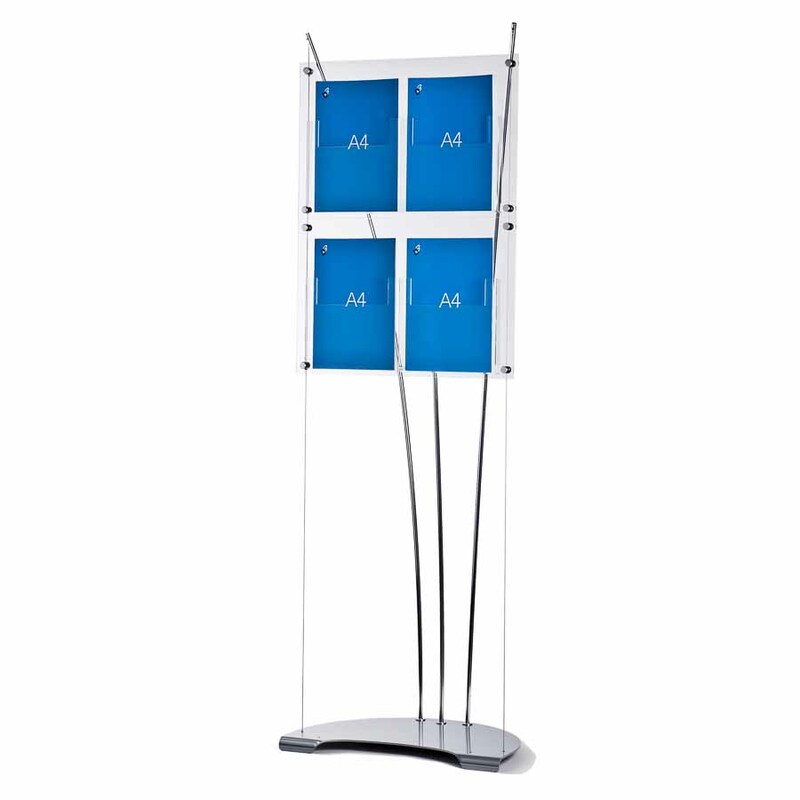 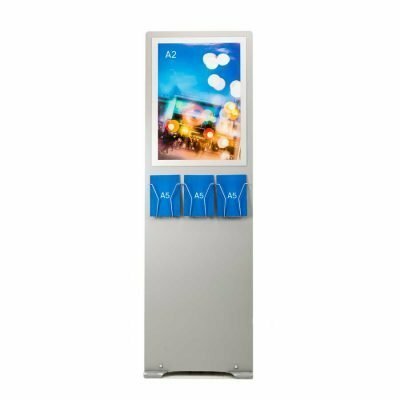 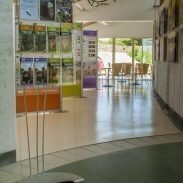 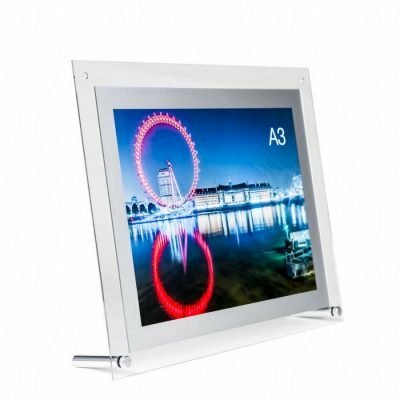 Displays are also suitable for public areas including corporate offices, meeting rooms, showrooms, events spaces. 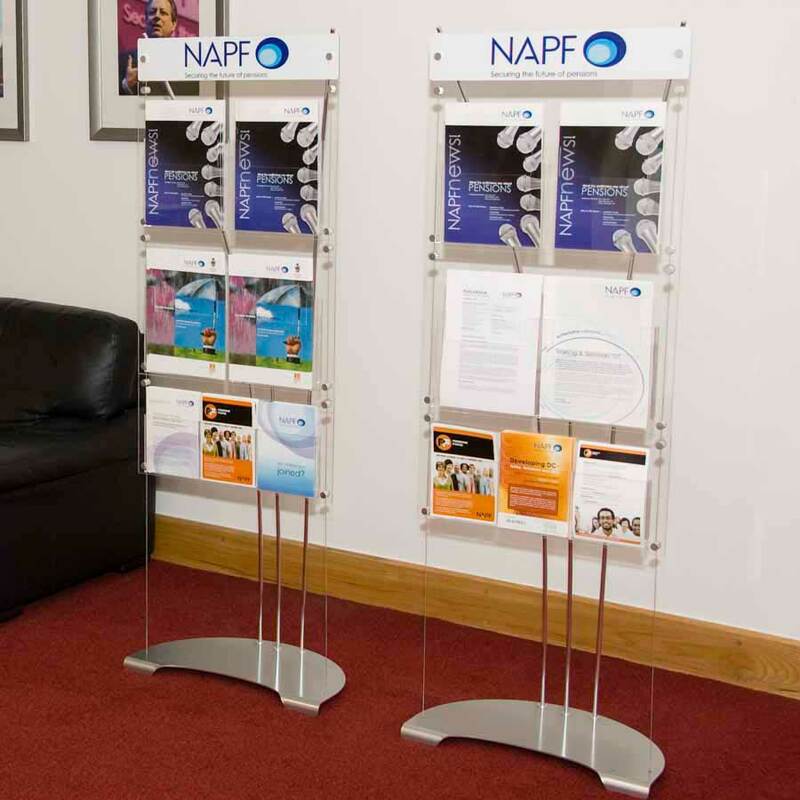 Build your own brochure holder stands by specifying the pocket size & number of rows of acrylics required. 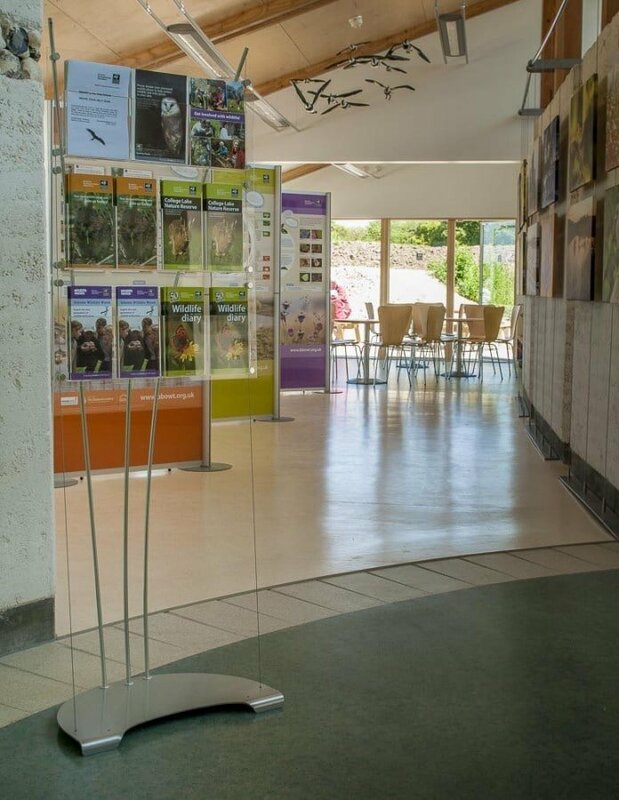 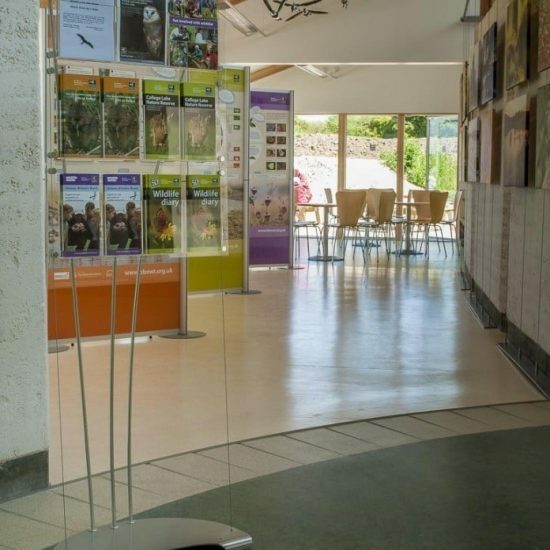 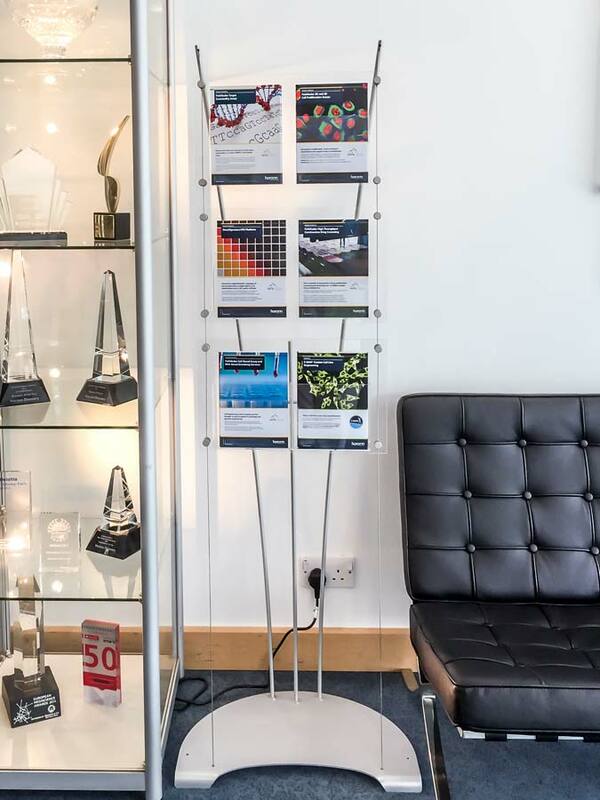 Visit our brochure holders gallery to see how our clients have configured their displays. 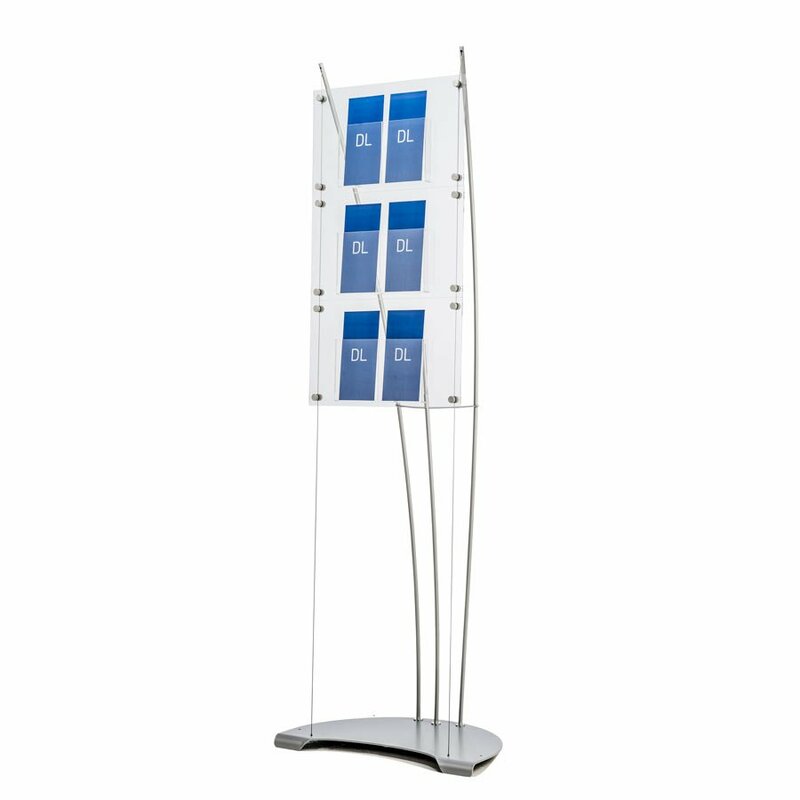 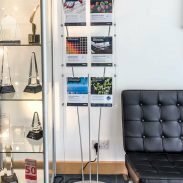 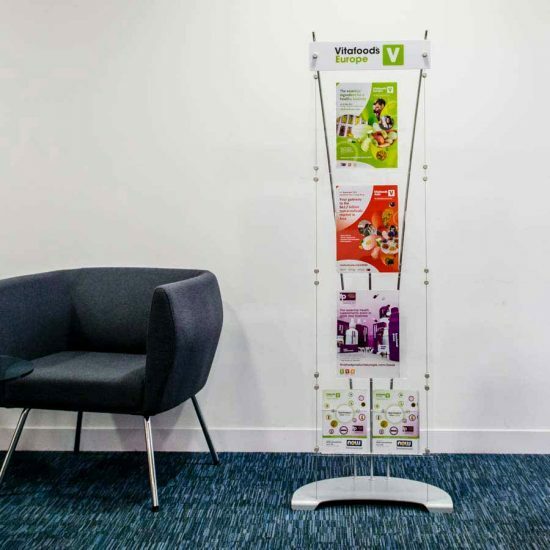 Stylish free standing brochure holder. 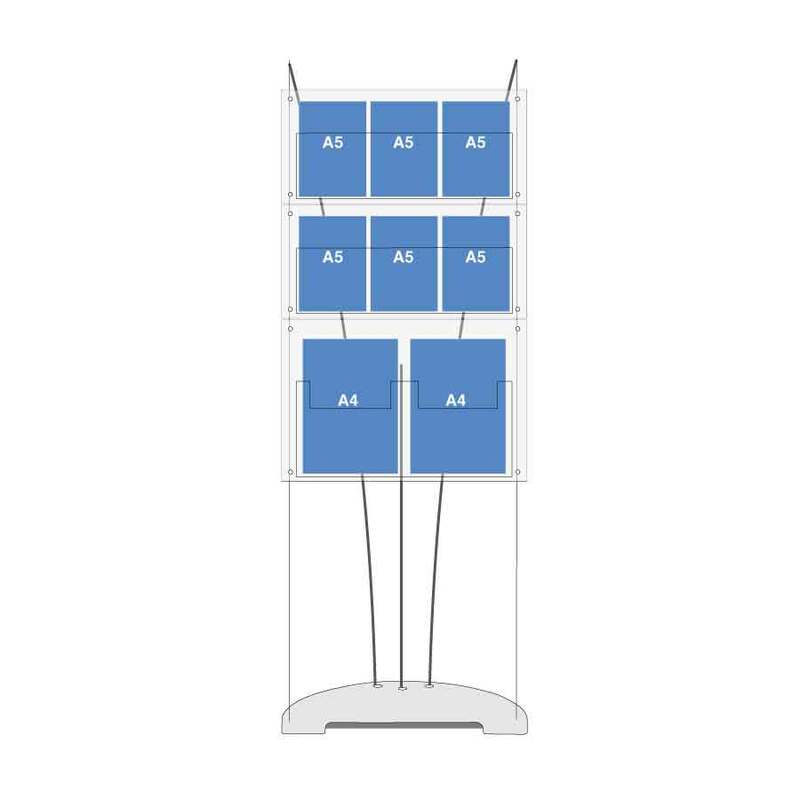 Steel baseplate makes the display very stable. Flexibility to add other sizes of brochure pockets later, saving from having to buy a whole new system. 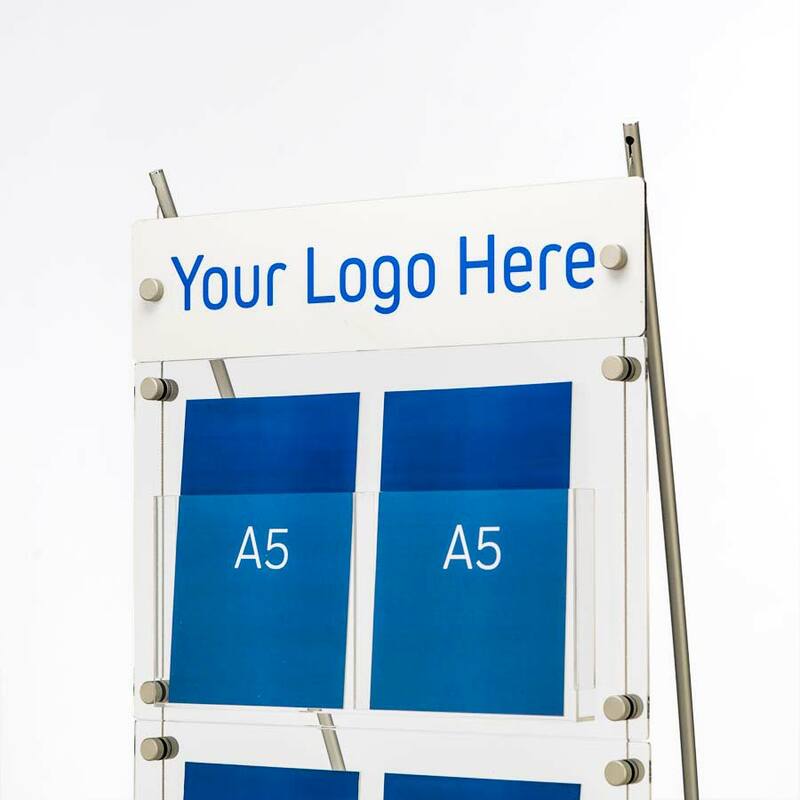 Add branding to your brochure holder with a graphic header. 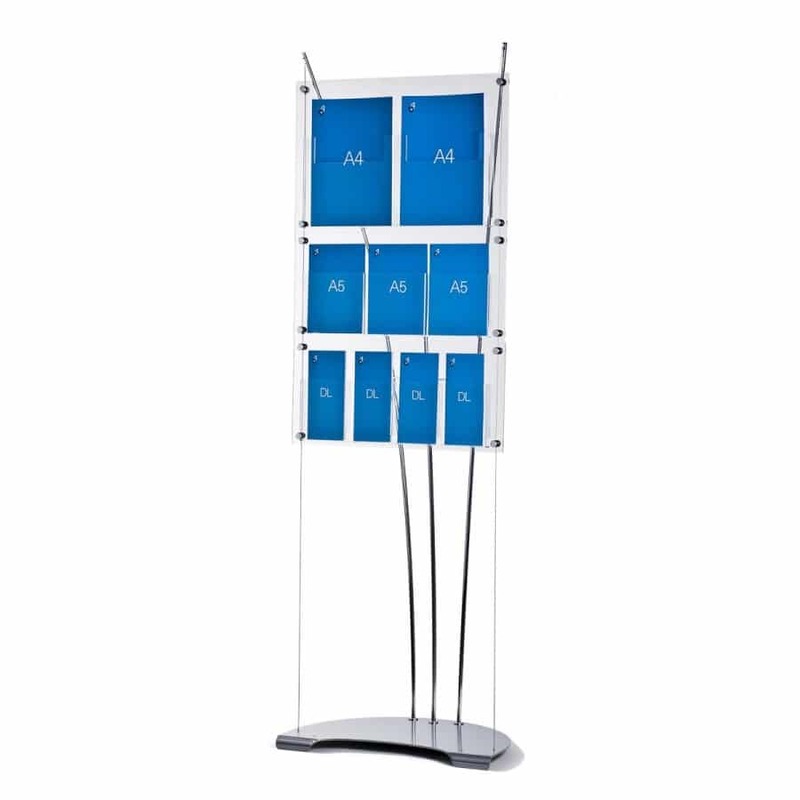 D3 Display brochure holders come with a 10-year guarantee against production defects. 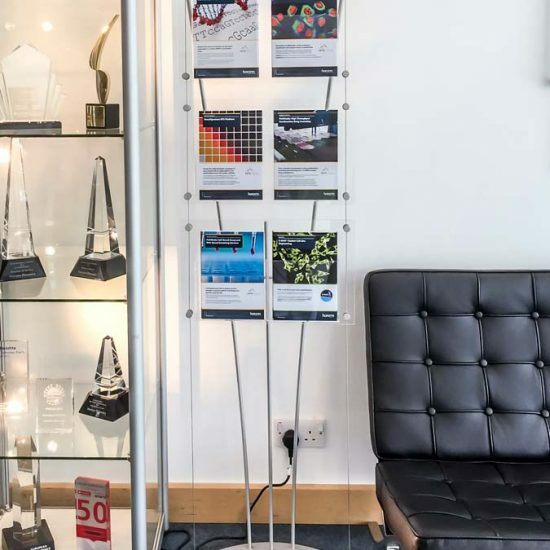 Dealing directly with manufacturer means you get the best prices and quick service from our London office. Displays are in stock for delivery within 1 – 2 working days. 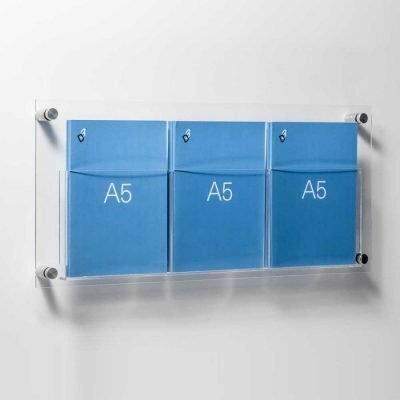 All acrylic brochure pockets are 20mm deep.